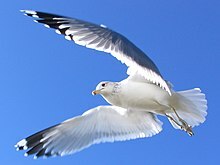 The miracle of the gulls is an 1848 event often credited by Latter-day Saints ("Mormons") for saving the Mormon pioneers' second harvest in the Salt Lake Valley. According to accounts, seagulls miraculously saved the 1848 crops by eating thousands of insects that were devouring their fields. The first crop was planted in 1847 just a few days after they entered the valley, which was very late in the growing season and produced a meager but utilizable harvest. The following spring, using seed from the first harvest, they planted their second crop, only to watch in dismay as the crickets attacked. Less than two years prior in October 1846 many of them were saved by quail that flew into their camp, on their trek to the Great Salt Lake and made available as food. 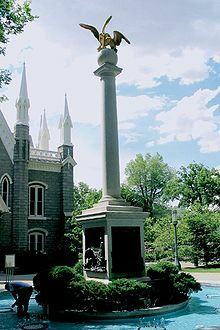 After Brigham Young led the first band of Latter-day Saints into what is now Salt Lake City, Utah, the pioneers had the good fortune of a relatively mild winter. Although late frosts in April and May destroyed some of the crops, the pioneers seemed to be well on their way to self-sufficiency. Unfortunately, swarms of insects appeared in late May. These insects, now called "Mormon crickets" because of this incident, are not true crickets, but instead belong to the katydid family. Having ornamental wings, they are unable to fly, but instead can travel in huge swarms. Mormon crickets eat all plant material in their path, but they also eat any insects that die on the way, including their own species. They are known to cyclically swarm in some areas of the Mountain West, especially in Utah and Nevada. These insects threatened the livelihood of the Mormon pioneers; stomping on the pests did not dissuade them from entering farms as others would advance. This is a reproductive strategy similar to mast reproduction in oaks, overwhelming predators with sheer numbers allowing a percentage of the population to survive to reproduce. Mormons often cast this disaster in Biblical terms like the 8th plague of locusts. According to traditional accounts, legions of gulls appeared by June 9, 1848 following fervent prayers by the pioneer farmers. It is said that these birds, native to the Great Salt Lake, ate mass quantities of crickets, drank some water, regurgitated, and continued eating more crickets over a two-week period. The pioneers saw the gulls' arrival as a miracle, and the story was recounted from the pulpit by church leaders such as Orson Pratt and George A. Smith (Pratt 1880, p. 275; Smith 1869, p. 83). The traditional story is that the seagulls annihilated the insects, ensuring the survival of some 4,000 Mormon pioneers who had traveled to Utah. For this reason, Seagull Monument was erected and the California gull is the state bird of Utah. ^ See, e.g., William E. Berrett, The Restored Church (Salt Lake City, Utah: Deseret Book, 1961) pp. 283–85. Leonard Arrington & Davis Bitton, The Mormon Experience at 104 (Alfred A. Knopf, 1979). Hartley, William G. (February 1992), "Mormons, Crickets, and Gulls, A New Look at an Old Story", in Quinn, D. Michael (ed. ), The New Mormon History: Revisionist Essays on the Past, Salt Lake City, Utah: Signature Books, ISBN 1-56085-011-6 . Pratt, Orson (June 20, 1880), "The Gathering of the Saints—Their Sufferings—Ancient Predictions Fulfilled—Crickets and Their Miraculous Destruction—Crops Saved—Desert Made Fruitful—God's Kingdom in the Mountains—Its Future Destiny—The Coming of the Lord", Journal of Discourses By President John Taylor, His Counselors, The Twelve Apostles and Others, 21, Liverpool: Albert Carrington, pp. 272–280 . Roberts, Brigham H. (1977), A Comprehensive History of the Church, 3, p. 333 . Smith, George A. (June 20, 1869), "Historical Discourse by President George A. Smith", Journal of Discourses by President Brigham Young, His Two Counsellors, and the Twelve Apostles, 13, Isleton, London: Horace S. Eldredge, pp. 77–87 . Smith, Joseph Fielding (1950), Essentials in Church History, Salt Lake City, Utah: Deseret Book Company, p. 385 . Whitney, Orson F. (1888), The Life of Heber C. Kimball, pp. 388–398 .